Biking alongside traffic can be a stressful experience in many cities. Dedicated bike lanes are the best solution for protecting cyclists—however, many cities struggle to even put in painted lanes—a simple and cost-effective solution. 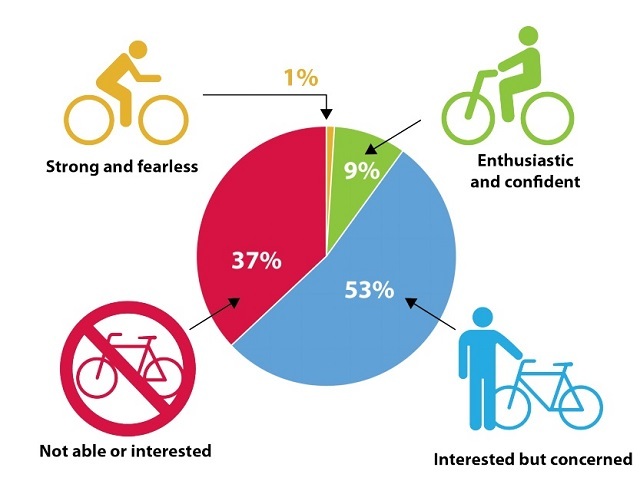 At worst, cyclists have no designated road space, forced to dangerously mingle with traffic. Anxiety about this lack of protection and risk of harm is a major turn off for many potential cyclists, pushing them to rely on private vehicles. The latest World Health Organization’s “Global status report on road safety,” published last month, backs up these fears with evidence. Despite being a fraction of the users on the road, approximately 50,000 cyclists die every year across the globe. This makes cyclists one of the road’s most vulnerable users. To save lives in a variety of urban contexts, some architects and urban planners have innovated a range of solutions for protecting cyclists from motor vehicles. 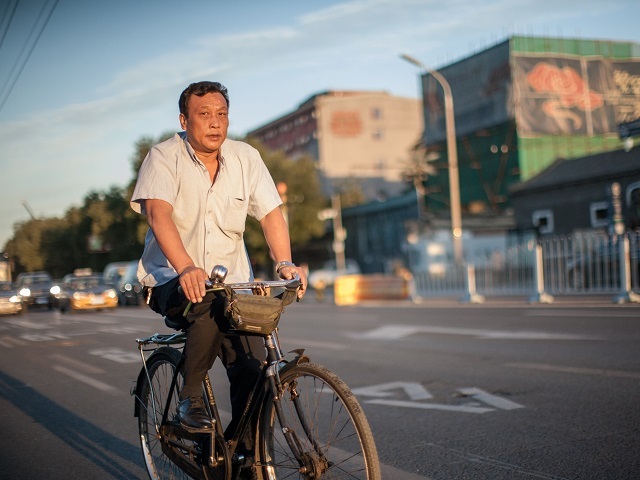 Cities in China, for example, have experimented with fences to make sure vehicles don’t enter bike lanes; and while they can’t guarantee the safety of cyclists, they do work to reduce the chances of a crash occurring. However, protected bike lanes have a major problem: the intersection. To allow cyclists to turn left (and cars to turn right), the barriers between cyclists and vehicles almost always end at intersections, resulting in a mixing of cars and cyclists. This is especially problematic since intersections are one of the most dangerous areas on the road for cyclists. In response, some urban planners are innovating new intersections that help to protect cyclists while boosting their mobility. 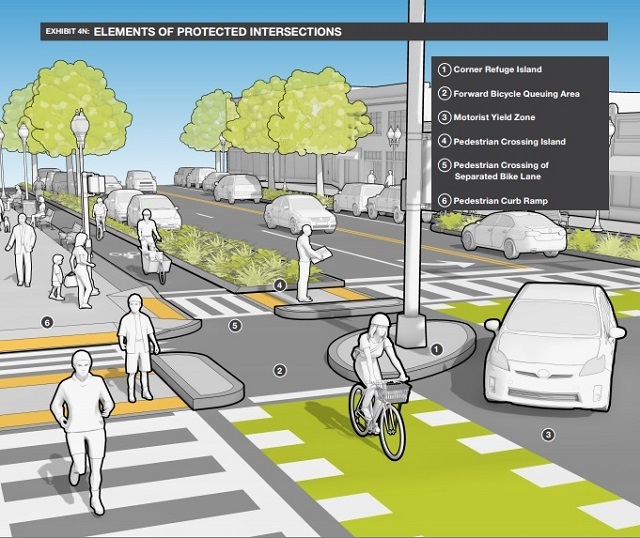 Rather than simply ending all protection for cyclists as they enter the intersection, the protected intersection has six main features that safeguard pedestrians and cyclists. One of the most significant changes is the corner refuge island, which shields cyclists as they turn right and wait for green lights. Furthermore, by situating cyclists farther into the intersection than vehicles, the corner refuge islands ensure that motorists waiting to turn have full vision of cyclists. Another hallmark of the guide is its streamlined use of signage and painted roads to clearly communicate directions and intended paths. One of the largest obstacles new road designs face is the lack of familiarity road users experience when encountering them—sometimes leading to an increase in traffic crashes. However, MassDOT’s design clearly identifies pedestrian crossings and differentiates them from cycling paths, allowing drivers to anticipate areas of potential conflict. Moreover, the refuge islands slow cars down by forcing them to take near 90 degree turns. 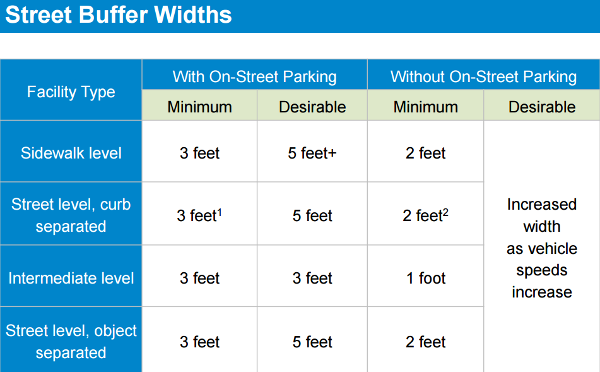 Finally, MassDOT’s guide also yields a number of benefits for pedestrians. First and foremost, refuge islands and protected bike baths keep pedestrians farther away from main roads, significantly reducing the chances for traffic crashes. Further, the guide calls for all pedestrian crossings to feature a curb ramp to allow persons with disabilities and the elderly to better access street crossings. While we may be a while off from seeing the majority of intersections being transformed to protect cyclists and pedestrians, there are more tools now than ever to help cities implement new measures with cyclists in mind.